When I was in college, I had a professor who taught a unique approach that motivated us to think way outside the box when contemplating a big project. It was called “DBA.” Instead of taking hours or days staring at a blank page, he suggested that we work in stages. D: Create a project that would be considered a “D.” Do it in about 10 minutes, no more than that. Just write whatever comes to mind. He would tell us what he loved about our idea, which gave us forward momentum. B: Taking his comments, we built on that and spent an hour or two, not worrying about dotting the i(s) and crossing the t(s). He told us what he loved about our project and sent us back to clean it up. A: We would take as much time as needed (within the deadline) to move our project from a “B” to an “A” so we could hand in our best work. He proved to us that this step-wise approach took less time and led to a superior project. 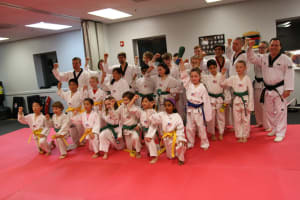 We apply the D, B, A approach in teaching martial arts, particularly to our 7-8 year-old White Belts. For example, let’s say we are teaching a student how to do a front kick in his second class ever. We resist the urge to tell him to keep his hands up, bend his knee, chamber, kiyap, all while remembering not to stub his toe. He used the ball of his foot. Great!!! We offer genuine praise for that. We don’t even mention right now about all the other stuff. We tell him to keep focusing on using the ball of his foot. Remembering to pull back the toes is important, so that he doesn’t hurt himself. He may spend a few classes on just that. Next, we pick one additional element of the front kick and add that to his thinking. We praise him when he nails it. After three months, the student has a solid Yellow Belt level front kick, which was the goal all along! He never felt defeated, and he finished with the same “A” work that those looking for "perfection" were trying to get on that first day. The same can be applied to forms, one-steps, or any element of Tae Kwon Do. This is particularly true with students age 7 and 8. Their brains can only focus on so many elements at once. What they need is CONFIDENCE. What they crave is the need to feel IMPORTANT and APPRECIATED. As a general rule of thumb, when teaching a new technique, we allow 25 times or so for them to get used to the new movement. If we see them growing frustrated, we break it down to smaller steps, again, focusing on what they do well. We show them several times, and then have them do it with us. I wish I could thank my old college professor. Who could have known that what he taught in a Communication Theory class in the 1980s would be building skill and confidence in hundreds of martial arts students in the Bucksmont and Brandywine areas in 2018. So here goes. Thanks Dr. Luker!